Thanksgiving is just about my favorite meal to cook. Under the guidance of my New Orleans born stepfather I cooked my first thanksgiving dinner when I was 9 years old and with few exceptions I’ve cooked one every year for 65 years! 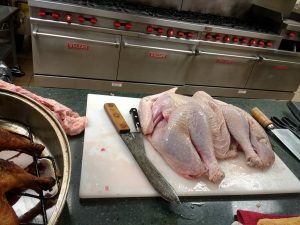 For the past 15 years or so I’ve spatchcocked and partially deboned the turkeys (I almost always make two). The bird cooks much faster and I get all the raw bones for gravy stock. 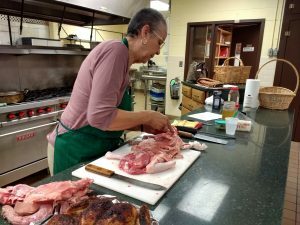 Yesterday working in the CATEC kitchen (Charlottesville-Albemarle Technical Education Center) I passed on a bit of my experience. 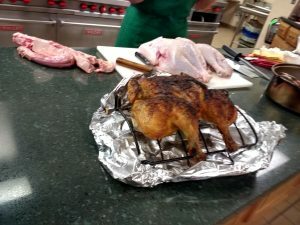 I spatchcocked a turkey and then deboned it with 9 students. With a large roast chicken, also spatchcocked, that I brought ready cooked to the class we used the pan juices to make a rich gravy. That skill seems to be one that many a cook finds intimidating! 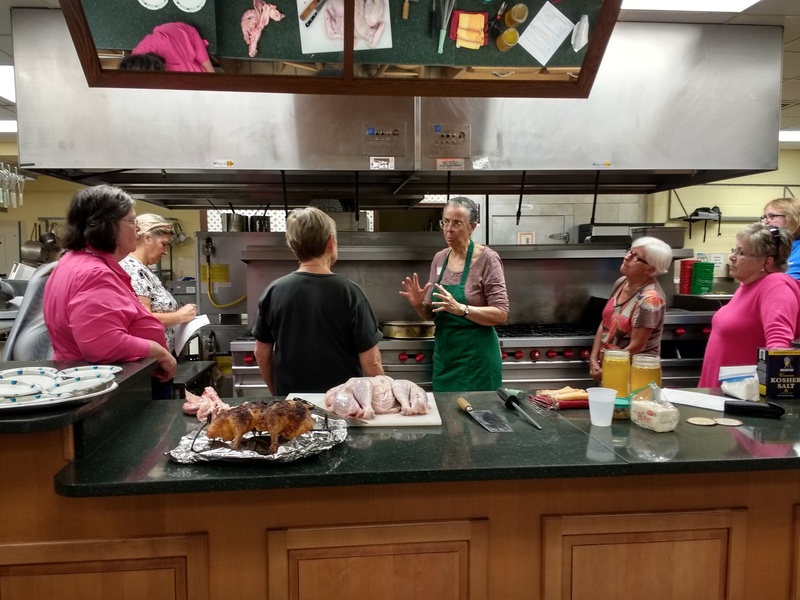 As we ate our chicken and gravy we talked brining, and seasonings and roasting temps. From the animated discussion of side dishes it is clear that while dressing/stuffing, mashed potatoes and green beans are usually on the table some version of cranberry sauce is absolutely essential; one woman makes hers with red wine and orange peel! I offered my ‘no marshmallows anywhere near yams’ speech – Candied Yams actually becoming ‘candied’ by long slow baking of par-boiled yam slices drenched in butter, brown sugar, cinnamon and nutmeg so that that they are candied by baking – not by adding white candy to mashed yams. So there. Turkey is wonderful. At this time of year turkey is inexpensive but because it is a seasonal item I almost always buy three or four birds to keep in the freezer for times during the next year when I want a festive meal. After the big day is over there are the leftovers. Instead of going shopping the next day I make turkey pies for the freezer using leftover turkey, veggies, gravy and mashed potatoes.